We work hard in the rehearsal studio to bring you a polished live performance. With attention to detail, Bumpasonic is ready to entertain you. Bring your dancing shoes: you are gonna need 'em. The Kraken - Saturday, February 2, 9:00-1:00 A.M. The Pour House - Saturday, April 13, 4:00-8:00 P.M. The Pour House - Saturday, May 4, 9:00-1:00 A.M. 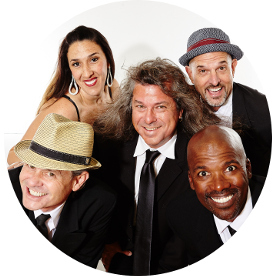 The Pour House - Saturday, June 8, 9:00-1:00 A.M.
Bumpasonic is a high energy, all live, dance band that performs modern dance music and a wide range of classic dance favorites. Bumpasonic will keep the dance floor jumping all night long, playing hits from Pharrell, Bruno Mars, Meghan Trainor, and Magic! in addition to classic dance hits by Earth, Wind, and Fire, Stevie Wonder, Prince, Donna Summer, Aretha Franklin, and many more. 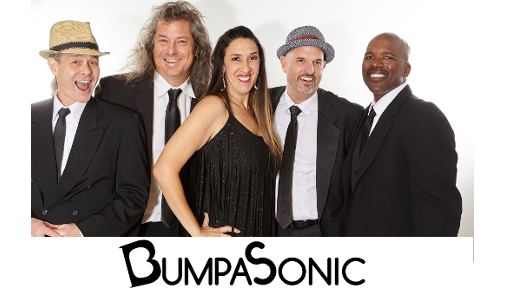 The members of Bumpasonic have entertained audiences of all sizes, from 100 to 50,000 enthusiastic fans. With years of experience performing at various types of events, both locally and abroad, Bumpasonic has the knowledge and professionalism that clients can rely on. Bumpasonic is passionate about making your event successful and memorable for years to come. Bumpasonic is Shaina Pugh, Mark Dycaico, Anthony Sarain, Keith Elliott, and Geoff Brown. Get to know us via video, photos, and social media. Better yet, come see a show. We have fun. And we make sure our audiences do as well. We had a blast doing our photoshoot. Watch us strut our stuff! We are honored to be part of a happy couple's most special day. You will have an energetic, professional, sharp-dressed band making your special day stand out. We work hard to make the live entertainment the most stress-free part of the day. We are happy to play any song you desire for the first dance. If we don't play it currently, we will learn it, just for you. And we dress the part. From stylish tuxedos and gowns to cool/hip attire, we will fit the overall theme of your wedding day. And if one of your guests (or the bride/groom!) wants to sing a song with us, we will provide rock solid backup. Our state of the art digital sound system is available for you to make announcements or toasts. Our sound engineer will be there to make sure everyone can hear the speaker, but that the volume is always appropriate for the situation. Bumpasonic has played for audiences of all ages. We bring an energy to outdoor concerts/festivals that goes the length of a football field. You never have to worry about inappropriate songs or language, we are there to provide family friendly entertainment. We have played for many community concerts and outdoor events. Your nightlife entertainment must provide energetic dance music with perfect pacing. Bumpasonic has the experience to pump up the energy, or slow it down to let the couples get close. The dance floor is always packed when Bumpasonic is playing. We have a track record of being the best producing band at various nightlife venues in San Diego County. © Anthony Sarain. All rights reserved.